Contrary to what I had imagined, track down Kay, or at least his new living place, was not that complicated. A brief look in the police files to which I could have access thanks to an internal contact taught me Kay had asked for a transfer in a town located about 80 kilometres far from here. It took me around two hours to reach that city. Once arrived near the obtained address, I park in the street. I hesitate during what appears to be long minutes before getting out of the car. This is completely crazy. What am I about to say to Kay ? How will he react when seeing me ? I tremble just by the thought of it. The last time I saw him, I clearly suggested him it was preferable to leave in order to avoid troubles and I had abandoned him. He will never be able to forgive me. I reflect on this entire story. Actually, I have been a perfect egotistic from the beginning to the end with Kay. This is him who has always bent over backwards for me, to help me, for us to live our relationship secretly. And I have almost never expressed all the love I truly felt for him in return. He was entirely right when he said me “With you Marc, it’s always me, me, me”. I never thought about him, about his problems, about everything he could feel. By the way was he really in love with me ? Maybe our relation was just physical. At least, I will know for sure when I will see him. As for me, I know I have deep feelings towards him, otherwise I would not come up to here. When I finally decide to get out of my Golf, I join the building where Kay is domiciled. It is the beginning of the evening, and I dare hope he is home right now. When I arrive in front of the block, I realize an entry code is necessary to get in, and there is no intercom. I’m blocked outside. This only thing I can do is go back to my car and hope having the chance to see Kay get in or get out. Just when I am about to leave, an old woman waves at me and come open the door. – You come to see somebody ? she asks me. – Hello. Yes, I come to visit Kay. Kay Engel. – Come in young man, I’m the janitor. I penetrate in the entrance hall of the building. – Are you sure you are at the right place ? Kay has vacated the premises not so long ago, she says to me while turning over. I am surprised and terribly disappointed at the same time by this announcement. – Nearly two weeks now. He has departed so quickly, in all haste. So well that he has left a mount of stuff, and the landlord pesters me for his apartment to be cleared. There are a lot of personal objects, I don’t know where to start. – Would you mind showing me his apartment ? – No, no problem. Follow me. We take the stairs to go to the second floor. The old woman opens the door of the apartment. – Have you forgotten something at his place ? – Uh, yes, I lie, destabilized by her question. He had borrowed me a document I need urgently. – Very well, I let you. I will verify that the cleaning agent has washed the bathroom and that it is in order for the first visits meanwhile. While the janitor is leaving, I go in Kay’s bedroom. Everything is tidy and the bed is made. I can’t help myself sitting on it and breathe the sheets while sweeping my hand on them. I have the impression of smelling the sweet scent of Kay. My gaze turns upon the bedside table. I open its drawer and find with surprise a damaged photo inside. I grab it and discover with emotion a shot of Kay and I we took during a jogging session we made in the forest. We are smiling and we look happy. I had completely forgotten that picture. I had let it to him because I didn’t want to take the risk that Bettina finds it, even if it would have change nothing in the end. Emotion rises in me at the sight of this beautiful image, so well that tears start to fill my eyes. I get up and join an adjacent room filled with darkness. When I open the light, I discover with surprise a place full of paintings and sketches left as they are. – Young man, your friend has left many drawings and paintings, as you can see, tells me the janitor while arriving at the bedroom doorstep. Isn’t it what you’re looking after ? Surprised in my loneliness, I discreetly dry my tears and turn toward her. – What are you talking about ? Uh no, the canvases don’t matter. She joins me and enters the room. – Have you found what you were looking after then ? – No, I say while hiding the photo in one of my back pockets. – So this is maybe in this room after all. Cast a glance there. – Kay has created all of this ? I say with astonishment. I never knew Kay was drawing and painting. He never talked to me about it and I never saw any painting in his last apartment where we used to see each other. I’m struck when looking more precisely at his drafts to realize they all represent a masculine figure. – I’ve discussed a little bit with Kay, he confided in me sometimes. He was a solitary person, with a hidden nature, explains to me the old woman. From what he has told me, all these paintings represent a boy he used to know, a certain Marc. I feel a thrill travel across my back but let nothing of it appear. I then approach myself from other canvases and observe closer the drawings. There is no doubt we can recognize some of my physical features on them. – What looks strange, is that Marc seems so sad on these canvases. Like jaded, bitter, she says to me. – Or heartbroken, I mumble. – Kay never said to me who this Marc was. – Maybe he was just his model ? I throw to cover myself in case the old woman would recognize me from the drafts; I prefer to stay discreet as much as possible. The janitor gets closer to me and points a finger upon several sketches. – It may have started that way, but it became more. Look at the way he … captured Marc. The curve of his back. The softness of his skin. Kay was under the spell of Marc, spending every waking moment painting him. He was in every brush stroke. I know it doesn’t concern me, but Kay loved this man, it’s obvious. – But they were not together, I say trying to put up a smokescreen. Kay never talked to me about a Marc. – Frankly, I find that hard to believe. I don’t know, maybe Kay wanted all this to remain secret. Maybe they broke up. Painting was probably the only way Kay had to be able to live this romance. – But if they loved each other so much, I asked, why would Marc push him away ? – Maybe there was someone else, someone that don’t wanted them to be together. Or Marc didn’t feel worthy of Kay, he doubted the way he felt about him. Or all of this together. I remain silent a few moments. Until I notice the gaze of the janitor looking hard at me. – You’re Marc, isn’t it ? she questions me. – Yes … I admit in a whisper. – I figured it out the moment I saw you arrive. I was telling myself that your face was familiar to me. I had already seen it on those sketches several times. I don’t know what to answer her. – It is not for something that you came back. It’s for Kay. – And he is gone now, I finally answer her, bitter. A few tears flood my face. – I love him so much. I would give anything to find him again, I say while touching smoothly one of the sketches, which represents me in Kay’s arms, as if nothing could separate us, as if we were together for eternity, frozen into that pleasant position. – I can perhaps help you. The only thing I know is that before leaving, Kay told me he was heading to Düsseldorf, to flee as far as possible. To start over. – Did he give any address ? I ask feeling an insane hope invade me. – No. As I told you, he left so quickly. I stay a few more minutes inside the apartment. I take care of getting back some drawings as a souvenir, in case I would never see Kay again. I dry my tears and after having warmly thanked the old woman, I leave the building. In the street, I take back out the photo where I am with Kay. Why do you escape me when I finally decide to repair my mistake ? I hold on to my deep desire to see Kay again. As long as I won’t have found him, I won’t surrender. I get back inside my car and turn on my GPS. Cette entrée a été publiée dans Écriture, et marquée avec Chapter 5, English, Fanfiction, Free Fall, Free Fall 2, Free Fall : Renaissance, Free Fall Part 2, Freier Fall, Hanno Koffler, Kay, Kay Engel, Marc, Marc Borgmann, Max Riemelt, Nocturne, Sequel, Stephan Lacant, Writing, le 7 juin 2014 par R.G. Corvin. Contrairement à ce que j’avais imaginé, retrouver la trace de Kay, ou du moins son nouveau lieu de vie, n’avait pas été si compliqué. Un rapide coup d’œil dans les fichiers de la police auxquels j’avais pu avoir accès grâce à un contact interne m’avait appris que Kay avait demandé un transfert dans une ville située à environ 80 kilomètres. Il me fallut environ deux heures pour la rejoindre. Une fois arrivé non loin de l’adresse obtenue, je me gare dans la rue. J’hésite de très longues minutes avant de sortir. C’est complètement fou. Que vais-je dire à Kay ? Comment va-t-il réagir en me voyant ? J’en tremble rien que d’y penser. La dernière fois que je l’ai vu, je lui ai clairement laissé entendre qu’il était préférable de partir afin d’éviter les ennuis et je l’avais laissé tomber. Jamais il ne pourra me pardonner. Je réfléchis à toute cette histoire. En réalité, j’ai été un parfait égoïste du début à la fin avec Kay. C’est lui qui s’est toujours plié en quatre pour moi, pour m’aider, pour qu’on vive notre relation secrètement. Et moi en retour je ne lui ai pratiquement jamais exprimé tout l’amour que je ressentais véritablement pour lui. Il avait entièrement raison quand il m’avait dit « Avec toi Marc, c’est toujours moi, moi, moi ». Je n’ai jamais pensé à lui, à ses problèmes, à tout ce qu’il a pu ressentir. D’ailleurs était-il vraiment amoureux de moi ? Peut-être que notre relation était juste physique. Au moins, j’en aurais le cœur net en le voyant. Mais de mon côté je sais que j’ai de forts sentiments pour lui, sinon je ne viendrais pas jusqu’ici. Je suis bloqué dehors. Il ne me reste plus qu’à retourner dans la voiture en espérant avoir la chance de voir rentrer ou sortir Kay. Au moment où je m’apprête à repartir, une vieille dame me fait signe et vient m’ouvrir la porte. – Vous venez voir quelqu’un ? me demande-t-elle. – Bonjour. Oui, je viens voir Kay. Kay Engel. – Entrez jeune homme, je suis la concierge. Je pénètre dans le vestibule de l’immeuble. – Êtes-vous sûr que vous êtes au bon endroit ? Kay a quitté les lieux il y a peu de temps, me dit-elle en se retournant. Je suis à la fois surpris et terriblement déçu de cette annonce. – Environ deux semaines maintenant. Il est parti tellement rapidement, en toute hâte. Si bien qu’il a laissé tout un tas d’affaires, et le propriétaire me tanne pour que son appartement soit débarrassé. Il a laissé beaucoup d’objets personnels, je ne sais pas comment je vais m’y prendre. – Ça vous dérangerait de me montrer son appartement ? – Non, pas de problèmes. Suivez-moi. Nous prenons les escaliers pour arriver au deuxième étage. La vieille dame ouvre la porte de l’appartement. – Vous avez oublié quelque chose chez lui ? – Euh, oui, mentis-je, déstabilisé par sa question. Il m’avait emprunté un document dont j’ai besoin en urgence. – Hé bien, je vous laisse, je vais vérifier que la salle de bain a bien été nettoyée par la femme de ménage et qu’elle est propre pour les premières visites pendant ce temps. Tandis que la concierge est partie, je me rends dans la chambre de Kay. Tout est ordonné et le lit est fait. Je ne peux m’empêcher de m’asseoir dessus et de respirer les draps tout en passant ma main dessus. J’ai l’impression de sentir la douce odeur de Kay. Mon regard se porte sur la table de chevet. J’en ouvre le tiroir et y trouve avec surprise une photo abîmée dedans. Je l’attrape et découvre avec émotion un cliché de Kay et moi que nous avions pris lors d’une séance de jogging dans la forêt. Nous sourions et avons l’air heureux. J’avais complètement oublié cette photo. Je lui avais laissée car je ne voulais pas prendre le risque que Bettina la découvre, même si cela n’aurait au final rien changé. L’émotion monte en moi à la vue de cette belle image, si bien que j’en ai les larmes aux yeux. Je me lève et rejoins une pièce attenante à la chambre emplie de ténèbres. Quand j’allume la lumière, je découvre avec surprise un endroit rempli de tableaux et de croquis laissés tels quel. – Jeune homme, votre ami a laissé plusieurs dessins et peintures, comme vous pouvez le voir, me dit la concierge en arrivant sur le pas de la porte de chambre. Ce n’est pas ce que vous cherchez par hasard ? Surpris dans ma solitude, je sèche discrètement mes larmes et me retourne vers elle. – De quoi vous parlez ? Euh non, les toiles n’ont aucune importance. Elle me rejoint et entre dans la pièce. – Vous avez trouvé ce que vous cherchiez dans ce cas ? – Non, dis-je en cachant la photo dans une de mes poches arrière. – Alors c’est peut-être dans cette pièce. Jetez-y quand même un œil. – C’est Kay qui a créé tout ça ? fais-je avec étonnement. Je n’avais jamais su que Kay dessinait et peignait. Il ne m’en avait jamais parlé et je n’ai vu aucun tableau dans son précédent appartement où nous avions l’habitude de nous voir. Je suis frappé lorsqu’en regardant plus précisément des esquisses, je m’aperçois qu’elles représentent toutes une figure masculine. – J’ai un peu discuté avec Kay, il se confiait de temps en temps à moi. C’était quelqu’un de solitaire, avec une nature cachée, m’explique la concierge. D’après ce qu’il m’a expliqué, tous ces tableaux représentent un garçon qu’il a connu, un certain Marc. Je sens un frisson parcourir mon corps mais n’en laisse rien paraître. Je m’approche alors d’autres toiles et observe de plus près les dessins. Il ne fait plus de doute qu’on reconnaît certains de mes traits dessus. – Ce qui est étrange, c’est que ce Marc semble si triste sur ces toiles. Comme désabusé, amer, me dit-elle. – Ou il a le cœur brisé, bafouillé-je. – Kay ne m’a jamais dit qui était ce Marc. – Peut-être que c’était juste son modèle ? lancé-je pour me couvrir au cas où la concierge me reconnaitrait à partir des ébauches, je préfère rester discret autant que possible. La concierge s’approche de moi et me montre du doigt plusieurs croquis. – Ça a peut-être commencé comme ça, mais ça a pris une autre dimension, m’explique-t-elle. Il suffit de voir comment il a représenté ce Marc. La courbe de son dos. La douceur de sa peau. Il était sous son charme, passait tout son temps à le peindre. Il inspirait chaque coup de pinceau. Je sais que je n’ai pas à me mêler de tout ça, mais j’ai l’impression que Kay était amoureux de ce Marc. – Mais ils n’étaient pas ensemble, dis-je pour tenter d’effacer les pistes. Kay ne m’a jamais parlé d’un Marc. – Très franchement, j’ai du mal à y croire. Je ne sais pas, peut-être que Kay voulait que tout ça reste secret. Peut-être qu’ils se sont séparés. La peinture était sans doute le seul moyen qu’avait Kay pour pouvoir vivre cette histoire. – Mais s’ils s’aimaient comme des dingues, demandé-je, pourquoi Marc l’aurait repoussé alors ? – Peut-être qu’il y avait une tierce personne ou des gens qui ont empêché que ces deux là soient ensemble. Ou bien Marc pensait ne pas être digne de Kay. Ou les deux. Je reste muet quelques instants. Jusqu’à ce que je remarque le regard de la concierge qui me dévisage. – Vous êtes Marc, n’est-ce pas ? me demande-t-elle. Je me suis trahi moi-même. – Oui … j’avoue dans un murmure. – Je l’ai deviné dès que je vous ai vu arriver. Je me disais bien que votre visage me rappelait quelqu’un. Je l’avais vu sur ces croquis à plusieurs reprises. – Ce n’est pas quelque chose que vous êtes revenu chercher. C’est Kay. – Et il n’est plus là désormais, je lui réponds, déçu. Quelques larmes inondent mon visage. – Je l’aime tellement. Je donnerais n’importe quoi pour le retrouver, dis-je en effleurant un des croquis me représentant dans les bras de Kay, comme si rien ne pouvait nous séparer, comme si nous étions ensemble pour l’éternité, figés dans cette agréable position. – Je peux peut-être vous aider. Tout ce que je sais, c’est qu’avant de partir, Kay m’a dit qu’il s’en allait pour Düsseldorf, pour fuir le plus loin possible. Pour recommencer à zéro. – Il ne vous a donné aucune adresse ? je demande en sentant un fol espoir m’envahir. – Non. Comme je vous l’ai dit, il est parti si vite. Je reste encore quelques minutes dans l’appartement. Je prends soin de récupérer quelques croquis en souvenir, au cas où je ne reverrais jamais Kay. Je sèche mes larmes et après avoir remercié chaudement la concierge, je quitte l’immeuble. Dans la rue, je ressors la photo où je suis avec Kay. Pourquoi m’échappes-tu alors que je décide enfin de réparer mon erreur ? Je m’accroche à mon désir sans faille de revoir Kay. Tant que je ne l’aurais pas retrouvé, je ne baisserai pas les bras. Je rentre dans ma voiture et mets en route mon GPS. Cette entrée a été publiée dans Écriture, et marquée avec Écriture, Chapitre 5, Cinéma, Création, Fanfiction, Free Fall, Free Fall : Renaissance, Free Fall Part 2, Free Fall Sequel, Free Fall Suite, Freier Fall, Hanno Koffler, Kay Engel, Marc Borgmann, Max Riemelt, Séquelle, Stephan Lacant, Suite, le 7 juin 2014 par R.G. Corvin. Synopsis : Après des années de croisade en Terre sainte, le templier Behmen et son fidèle compagnon, Felson, reviennent en Europe, désabusés. Alors qu’ils aspirent à une vie paisible, ils découvrent leur pays ravagé par la peste noire et se retrouvent appréhendés par les hommes du Cardinal. Voilà un film que je devais voir depuis un sacré bout de temps, et c’est enfin chose faite. Je l’avais râté au cinéma, et au final je me dis que c’est pas plus mal … Le ton est donné. Ce qui m’a donné envie de voir ce film, c’est qu’en ce moment je suis dans une période où j’essaye de regarder et lire le plus possible de films et d’ouvrages avec des histoires de sorcellerie afin de voir comment le sujet est traité, car les sorciers sont des créatures qui m’intéressent pour de futurs récits. Après quelques films visionnés comme The Craft (critique à venir), j’en suis donc venu au Dernier des Templiers. Le film bénéficie d’une mise en scène correcte et d’un duo tête d’affiche sympathique, avec Nicolas Cage et Ron Perlman. Malheureusement ces deux atouts ne sauvent pas le film qui au final s’avère plus ridicule que divertissant. La faute à des personnages complètement caricaturaux, sans aucune once d’originalité, voire tête à claque (notamment le jeune chevalier joué par Robert Sheehan), et des intrigues pas franchement folichonnes. On retiendra surtout la prestation de Claire Foy, satisfaisante en sorcière en cage. Ainsi que le caméo de Christopher Lee, icône culte du cinéma fantastique des années 40 à 60 pour son rôle de Dracula dans les films de la Hammer. Bon point pour les décors qui sont vraiment magnifiques, autant les scènes d’extérieur que d’intérieur, et le film est assez convaincant à ce niveau. On a aussi le droit à quelques jolis plans (le château sur la colline au dessus duquel vole une nuée de corbeaux en tourbillon). En revanche on ne peut pas vraiment saluer les effets spéciaux, plus particulièrement les images de synthèse, qui sont vraiment limites et peu crédibles. Concernant l’histoire, j’ai vraiment été déçu, car on nous vend une intrigue sur fond de sorcellerie, et on se retrouve au final avec une espèce de problème démoniaque qui n’a plus rien à voir avec le début de l’histoire. Niveau sorcellerie je n’ai donc pas eu grand chose à me mettre sous la dent. Bref, Le Dernier Des Templiers est un film qui avait un certain potentiel, mais qui au final s’avère être un divertissement très moyen, la faute à des personnages peu intéressants et peu originaux et à un scénario digne d’un téléfilm de deuxième partie de soirée. 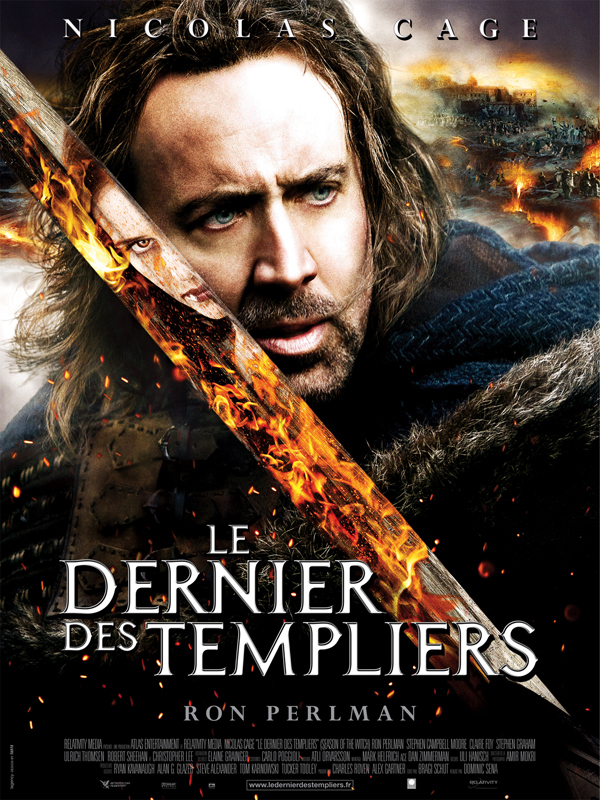 Cette entrée a été publiée dans Cinéma, et marquée avec Avis, Cinéma, Claire Foy, Critique, Dominic Sena, Film, Le Dernier Des Templiers, Nicolas Cage, Robert Sheehan, Ron Perlman, Season Of The Witch, le 1 juin 2014 par R.G. Corvin.